I'm back on the Stanford campus at the heart of Silicon Valley for my "ahem" 20th college reunion. Most of the alums headed to classes in stem cell research or the latest in data engineering. 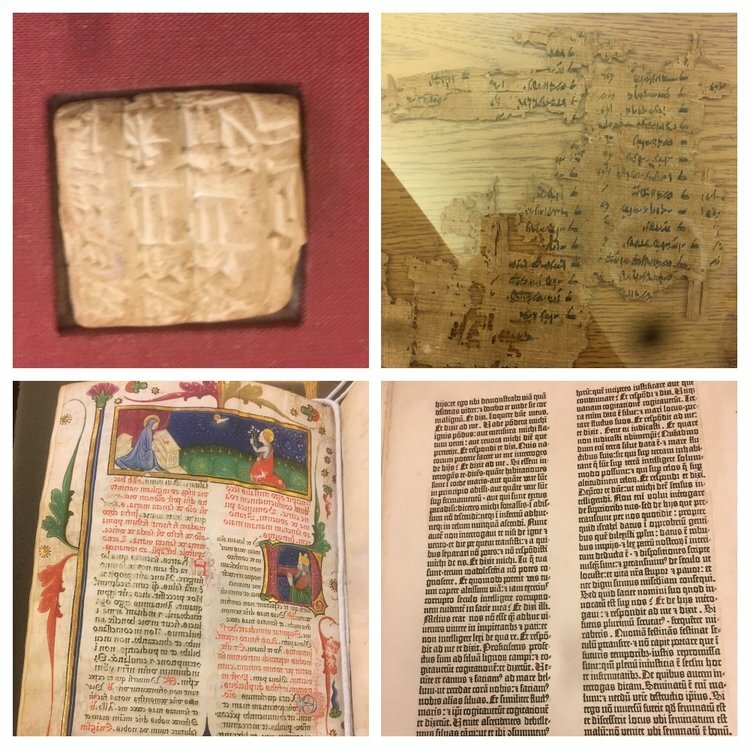 Forever the contrarian, I chose a session at the Stanford special archives where they had laid out twenty or so ancient texts for us to examine. A piece of clay scratched up with markings four thousand years old is called a cuneiform, a Sumerian way of transmitting information. Can you imagine how long it must have taken to scratch a few words into clay? Next up was papyrus from Egypt and then beautiful manuscripts from the medieval era. Monks took months, sometimes years, to carefully hand scribe letters to produce beautifully decorated books. Very few people would ever see or own these books. Taking ideas to the masses was difficult and slow. The collection also had a leaf of a book from the original Gutenberg press. In 1439, communicating information was revolutionised by this printing press. Below is a collage (badly) photographed by me at Stanford's Green library. There is a cuneiform from 2056 BC, followed by a scrap of papyrus, then an illustrated manuscript and finally a page from the original Gutenberg press. The dawn of the internet has touched off another revolution in transmitting data. Mass communication in investing is currently undergoing a major revolution. Information that was esoteric and hard to access, in the last 3-4 years has become low or no cost to ordinary investors like you and me. For investors the democratisation of information is changing things quickly. What once only well resourced fund managers could decipher with their teams of clever analysts and reams of data, you and I can see on the move and on our phones. In his biography "Snowball", Warren Buffett shares stories about having to actually visit company headquarters in person to obtain their annual reports. He claims that diligence in seeking out this hard to obtain data gave him an investing edge for many years. You and I can access thousands of pages of information on any given company almost instantly on the device you are reading this on. Below are a few software tools that are good at ferreting out valuable analysis for investors. I promise learning to use these tools is a lot easier than interpreting Sumerian cuneiforms! * I have no affiliation with any of these companies except as a user/ client.